Basic, to-the-point instructions on how to do stuff, practical DIY for the average guy. This is a really fun dish to make and the whole family will enjoy this novel and nutritious meal any time of the day. 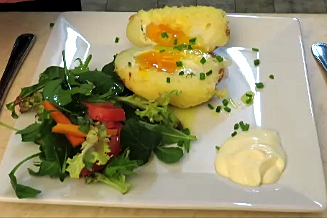 The egg will provide protein while the potato provides the carbohydrates; just add a garden salad for a perfectly balanced meal. Children love to be involved with these quirky kinds of dishes so let them help and they will more likely do justice to the meal. These are ingredients that are usually on hand so that makes this dish a nice one to fall back onto if the larder is a bit bare. This meal is quite filling so if you just feel like something light one could share one between two people. Blanch finely chopped onion in microwave for 30 seconds. 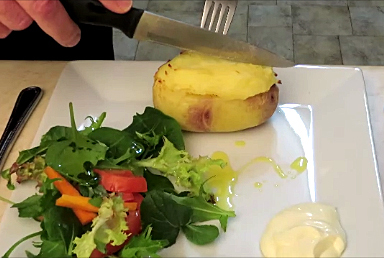 Pierce the potato and cook in jacket in the microwave. 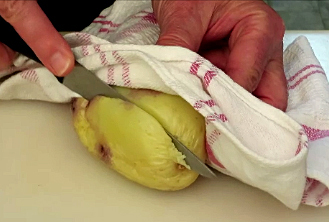 Lay the potato on its side and slice off one side. Scoop out the middle, leaving walls and floor of about 1 cm thick. Smear the cavity with butter and sprinkle some grated Parmesan, chives and some chopped onion in the cavity with salt and pepper to taste. 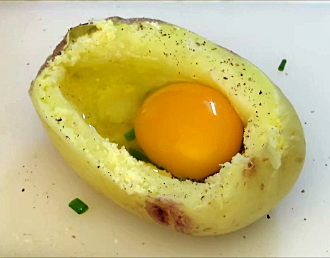 Crack raw egg into cavity and cover with either the side of the potato previously sliced off or make some mash with the inside of the potato and shape it to cover the egg. 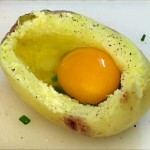 Bake in oven at 180 °C for about 18 to 22 minutes depending on how hard you would like your egg. 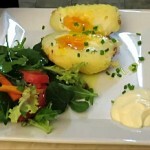 Slice potato length-wise and serve with a garden salad and dollop of 50/50 Greek yogurt and mayonnaise as an accompaniment. 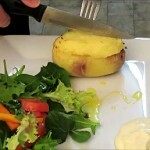 Here is a video demonstration of this dish. © 2019 Basic Lowdown.. No waffle — All Rights Reserved.